Over at Jones and Blount, there is a story up about NC Board of Education Chairman, Bill Cobey, going all in for John Kasich in the Presidential race. I don’t want to ever hear how NCSBE Chair Bill Cobey is a “Conservative” again. Yes, go work for Mini-Jeb! That makes total sense for someone who is allegedly a conservative. When was the last time we saw a sitting state board of education chair endorse a political campaign, much less work for one? Seems to me that with the Teacher Screening scandal going on right now and the fact he and Atkinson got their hands caught in the cookie jar misappropriating funds from the Excellent Public Schools Act, that perhaps he already has enough on his plate already? The Jones and Blount article details how Cobey worked with Kasich in Congress. The article also mentions that Cobey was Huckabee’s campaign chair in North Carolina when Huckabee ran in 2008 and in 2016. Gee, guess Cobey needed to find a new ship to hop on after Huckabee dropped out – again. Reminder: Holly Grange is running for the NCGA against True Conservative, Tammy Covil. Grange has aligned herself with the GOPe and Cobey. Grange even touted him coming to fundraise for her. Go read the latest on this race over at Daily Haymaker. Reminder: Kasich is a squish. He has zero respect for parents in his state or in any state who are fighting Common Core and has never missed an opportunity to insult them. Kasich and Huckabee both seemed to like smearing parents on Common Core, by the way. 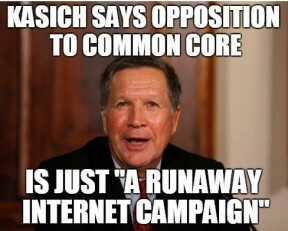 In fact, Kasich went to South Carolina in 2015 and mocked parents fighting Common Core by saying their complaints were ‘just a runaway internet campaign’. Maybe that’s why Cobey likes him so much. This entry was posted in ELECTIONS, LL1885, NC Board Of Education, POLITICS NC, Random Musings and tagged Bill Cobey, Governor John Kasich, Holly Grange, Mike Huckabee, Tammy Covil. Bookmark the permalink. Cobey has carried more water for conservatives in the state over the last 30 years than any of the commenters here. He is a man of integrity who is doing a tough job when he doesn’t have to because the Governor asked him to. It’s fools like you who will hand the state back to the Dems. What kind of public service do you people do besides run down good people on your nasty little website? Shame on you! Well, apparently my ‘nasty little website’ is hitting the mark. If Cobey was a conservative, what he is now is a shadow of one. People treat him like some sacred cow — it’s pathetic. What he did in his early days is not under fire here, what he is doing now in education is and I’m here to tell you it isn’t “conservative”, it’s a mixture of establishment and Democrat flavors. Hand the state back to the Dems? Dear, the Dems run education in this state. Cobey had a chance to get in there and change that, but instead he rolled over and is playing June Atkinson’s errand boy. It’s disgusting, frankly. The Governor is equally responsible for putting him onto the State Board of Ed — a place he was not suited for. Kasich.He’s a Democrat and a joke. Amazing that he would even call himself a conservative. Compared to what? Karl Marx?